Wasatch Backcountry Alliance has – like everyone else – seen the new proposals that Alta unveiled for the next five years – and since public comment periods that the Forest Service puts up are some of the most important actions that we as citizens can make in terms of our impact on our public lands – we would like to provide our perspective to help you frame your own comments. •	Adjust parking in the two base areas – one to create better accommodation for buses. An important part of Wasatch Backcountry Alliance’s mission is to maintain the existing balance of resort and backcountry terrain. An important strategy to accomplish this mission is to encourage the local resorts to improve their business by maximizing the opportunities that exist using their existing footprint; that is, without expanding into adjacent backcountry. Therefore, we were pleased that none of these proposals represented that, and in fact Alta’s stated desire to put a chairlift up into Grizzly Gulch, which would not only take out all of Michigan City, Twin Lakes Pass, and Patsey Marley backcountry skiing but also create easy-access side country into the entirety of Silver Fork was not included in this five year plan. So that is good. And at an estimated cost of $2-5 million for each of those lifts, if Alta spends $10-20M on the lift replacements alone and probably several million more on the other improvements, maybe it’ll be harder to justify further capital expenditures after this ambitious 5 year plan? More realistically, however, we hope that Alta is successful enough by staying within their footprint that they will not need to expand into Grizzly Gulch. That said, after watching the construction of the new Hidden Peak lodge atop Snowbird and now seeing that huge structure up there from nearly every vantage point in the Wasatch, we are philosophically “with” many people in the region who decry any further ridgeline development, backcountry or otherwise, as they are not only a blight on the horizons but also represent ever-more resort “creep” (Snowbird’s subsequent strong arm expansion into American Fork via the development-friendly Utah county being the prime example). Alta is using the “avalanche safety” of Baldy as its rationale, to which there are arguments for and against: it is a myth that there is a shortage of bullets to supply the avalanche guns, and avalaunchers are an effective tool in avalanche mitigation, and Alta has done fine for 85 years without a tram that also happens to have a 150 skiers-per-hour capacity to take people up there. Therefore, we are not willing to throw our support behind the tram. As to the remainder of the proposals – again, none of them threaten the backcountry and aren’t devastatingly un-environmental. 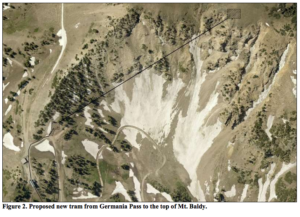 However, there is a lot of concern from Alta skiers – and over 75% of Wasatch Backcountry Alliance members are Alta skiers – that more, and more-speedy chairlifts will generate more skiers on the hill which will create crowding and even less time until the resort is tracked out after a storm. But formally, again, the Wasatch Backcountry Alliance wants to acknowledge that none of these changes affect the adjacent backcountry, and therefore don’t feel compelled to take a stand on those proposals. If you feel differently, please adjust your comments to the Forest Service accordingly. Hey its Alta’s National Forest Land, they can do whatever they want. The citizens can go kick rocks if they want undeveloped wilderness. It is Alta’s National Forest? NO! IT is the peoples National Forest. They are a lease with definitive terms. I’m in agreement with all of WBA’a comments. But, I have a concern about the proposed placement of one or more of the Pastey Marley GasEx’s. I think I can see 6 proposed GasEx sites in Figure 4. Although it is difficult to tell from Figure 4 exactly where they are located and how far below the ridge crest they would be, the most NEerly of them appears to be about 25 yards and maybe only 30′ to 50′ below the ridge crest from the top of The Huge Chute (THC) in Wolverine Cirque. This chute is frequently skied along with the 25 or so other chutes and chutelettes (Andrew McLean’s terminology) in Wolverine Cirque. It seems to me that vibrations from a GasEx release that close to the top of the ridge could cause sympathetic releases not only in THC but also in some of the other nearby, and maybe not so nearby chutes, especially those along the SW ridge line of the cirque, but potentially even all the chutes on all 3 sides of the cirque. In addition to storm snow releases, all those chutes develop pretty huge cornices by mid season that would also be susceptible to vibrations that could knock them loose, IMO. Sympathetic avalanches that roll down into the cirque would not only threaten skiers in the chutes themselves, but also skiers exiting the cirque along the floor below, especially near the bottom of THC. If GasEx releases were conducted during daytime skiing hours, including dawn patrol hours, I assume Alta would have a warning notification system for back-country skiers. However, skiers who ski those chutes approach them via many different routes, including Grizzly Gulch, Catherine’s Pass from the Alta side, Catherine’s Pass from the Brighton side, and perhaps even via Twin Lakes Pass from the Brighton side or even from Solitude. So, the warning notification sites will have to include a huge area, a lot of which is beyond Alta’s borders. “Do whatever they want” bc it’s their land is untenable. Should Alta be allowed to pit mine or or mine via mountain top removal of they wanted just bc they have a claim to national forest land? Obviously not. Only reasonable action as defined by the local owners and users of that land should be allowed. Otherwise, we’re hopping on a very slippery slope. When I moved here a little more than 40 years ago, Alta was within the budget of middle class people. That is no longer the case. The middle class is shrinking even as Alta and other resorts are becoming more expensive. Alta is now priced out of the reach of most of the middle class, and is becoming the exclusive domain of the richest 1%. I question whether this is still an appropriate use of public lands. The 1% can afford to buy luxury services on private lands. The remaining 99% of the people can’t, so need to use public lands at a price they can afford. I agree with WBA’s assessment. A lift to the top of Baldy is a bad idea aesthetically and culturally. Hiking Baldy has been an Alta tradition since it’s beginning. No need to change it. The other changes won’t effect us backcountry skiers. Though a lift to the top of Supreme from Alf’s will just add to a lousy run out making it even longer.